J.K. Simmons stopped by Saturday Night Live last night and performed a range of characters on the late night sketch comedy show. Among the many skits, were a mock version of his latest film Whiplash, where he reprised his role of the notorious sadomasochistic band conductor Fletcher, and a rendition of Casablanca, where he gave fans his best rendition of Humphrey Bogart. Watch him work the silver screen with Kate McKinnon in an alternate ending to the 1942 Best Picture Oscar-winning classic. 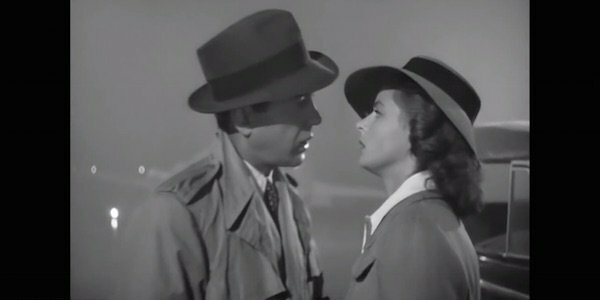 Those familiar with the 73-year-old romance drama Casablanca probably remember the ending to the film quite well. For those who don't, let me set the stage. Rick Blaine (Bogart) and Ilsa Lund (Ingrid Bergman) fell in love in Paris in 1940 when Ilsa thought her husband, and wanted Czech war leader, Victor Laszlo had been killed in a concentration camp during the war. When Ilsa re-enters Rick's life a year later, after leaving him without even a goodbye, to tend to her husband who was actually not dead but in hiding, the two reconnect and tie up loose ends. In the very last scene of the original film (the one mocked above), Ilsa thinks she and Rick are getting on the plane to escape to America, when in reality it is Ilsa and her husband Victor (who is already onboard), that will be leaving. Rick insists she get on the plane but she can't bear to leave him behind. The comedy in the mock scene above revolves around the fact that McKinnon's Ilsa is ready and willing to leave if Simmons' Rick would just let her go. So yeah, it takes a lot of explaining and backstory to really get where the comedy is in the skit but if you're familiar with the original film, you probably got a few chuckles out of it. Simmons was a fairly spot-on Bogart and McKinnon was hilarious with her over-the-top accented Bergman (she was absolutely the perfect choice to embody a mock Ilsa). If nothing else, fans of the original can get a kick from SNL's attempt at recreating the note for note feel and tone of the old film. I mean, they have gotten pretty good at whipping this sort of thing up. See for yourself below. D'Angelo was the musical guest on last night's episode and last week Blake Shelton acted as both host and musical guest. To help celebrate the sketch show's 40th year, SNL has an "Anniversary Special" scheduled this upcoming Feb, 15, 2015.